This week, the American Platinum Eagle, the official but oft-forgotten platinum bullion coin of the United States Mint, once again went on sale for the first time since 2014. The attention paid to platinum as an investment has risen substantially over the course of the year—in part due to the widespread use of platinum in the catalytic converters of automobile exhaust systems. Volkswagen (VLKAY), Europe's top automaker, boasts a line of vehicles that run on diesel fuel, which uses even more platinum to meet the "Clean Diesel" standard that VW claims (although this was placed in some question due to the company's "Dieselgate" emissions scandal last year). Nonetheless, strong auto sales so far this year were led by Volkswagen, which was the best-selling brand through the first half of 2016. 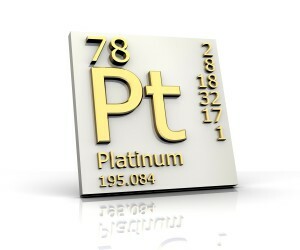 Beyond strong industrial demand improving platinum's prospects, investors have also chosen platinum as a precious metal alternative asset to gold and silver. For those portfolios with sufficient allocations of gold and silver, platinum can serve as a useful means for diversifying. Historically, platinum's price ratio to gold is usually not far from 1:1, but spot prices fell below $900/oz at their low less than a year ago. Thanks to a strong 2016 performance, platinum is currently back above $1,100/oz. Proof coins use frosted relief devices and mirror-like fields for an attractive visual effect. A lull in platinum demand during the bear market in commodities from 2013 to 2015 prompted the U.S. Mint to suspend production of the Platinum Eagle. That is not to say that the mint has neglected to produce any platinum coins in the interim. Each year since the series was introduced in 1997, the proof version (pictured, right) of the has continuously been sold. However, this is a collectible coin with a different market than the Brilliant Uncirculated bullion coin, which is priced much closer to the spot price of platinum. Nonetheless, it's worth mentioning that the Platinum Eagle Proof has seen rabid demand with the public. The mint frequently sells out of its allocation of 2016-W Proof Platinum Eagles within hours of going on sales. In fact, this year the full mintage of 10,000 coins sold out in just 56 minutes! The return of the bullion edition of the Platinum Eagle began earlier this week: the 2016-dated coins went on sale on July 25th. These coins are struck from investment-grade .9995 fine platinum, meaning it is 99.95% pure platinum. 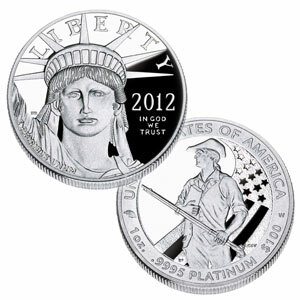 In total, each coin contains 1 troy ounce of pure platinum content. Similar to the case in 2015, the platinum bullion coin wasn't offered from 2009 to 2013. 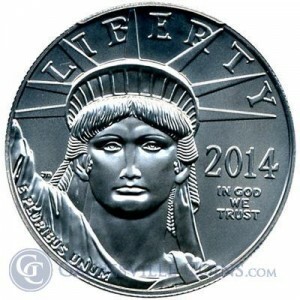 The Platinum Eagle is also typically offered in fractional sizes of half-, quarter-, and tenth-ounce coins. Unlike the proof version, which features an unique reverse design each year, the platinum bullion coin has stuck with the same design since being introduced in 1997. You can buy 2016 American Platinum Eagles at the link herein.